Domestic violence relationships exhibit certain characteristics that differ from healthy, intimate relationships. Understanding the difference may be the key to recognizing the need to seek assistance. Violent relationships usually do not begin with violence. Like normal, healthy couples, you begin with romance. During this time, the abuser attempts to bond or connect with their partner. Domestic violence partners then proceed into the next phase of the Cycle of Violence, called the Tension Building Phase, which is marked by power and control. The abuser begins to assert his or her power over their partner in an attempt to control the person's actions. Abusers will set rules for their partner that may be impossible to follow. They will tell their partner that there will be consequences if they break the rules. The consequences usually result in violence. Rules often may include no contact with family members, money spending rules and/or needing to obtain permission for everything they wish to do. Abusers use demeaning and derogatory phrases in an attempt to "objectify" their partner. This is done because it is easier to commit violence against an "object" rather than someone you are supposed to love. The abused partner may internalize their anger at the abuser's unfairness and experience physical effects such as depression, tension, anxiety and headaches. As the tension in the relationship increases, minor episodes of violence increase, such as pinching, slapping or shoving. The rules are nearly impossible to follow, but the abused partner tries to follow them in an attempt to forestall the inevitable assaults. The violation of the rules leads the couple into the next phase, the Acute Battering Phase. During this phase, the abuser exhibits uncontrolled violent outbursts. This is the shortest of the three phases but is the most dangerous. Abusers decide to teach their partner a lesson and may hurt them intentionally. The injuries may start out as minor, such as a slap, a pinch or hair pulling. As the cycle escalates risk of injury may increase. 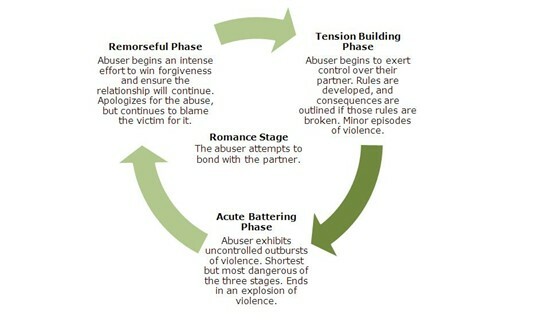 The abused partner usually reacts with shock, denial or disbelief and the cycle continues into the third phase. The Acute Battering Phase ends in an explosion of violence. The abuser may discount the episode and underestimate any injuries by making excuses. During this last phase of the cycle of violence, the abuser usually begins an intense effort to win forgiveness and ensure that the relationship will not break up. Abusers ask for forgiveness, say it will not happen again and behave in a very loving and kind manner. Often abusers use gifts to convince the victim to forgive them. The abused partner wants to believe that the abuse will end. The abused partner's feelings that the abuse will now stop is supported by the abuser's loving behaviour. Once violence has begun, it continues to increase in both frequency and severity.